TORONTO, ON--(Marketwired - December 06, 2016) - NewCastle Gold Ltd. (TSX VENTURE: NCA) (NewCastle Gold or the "Company") is pleased to report assay results from 11 additional core and reverse circulation ("RC") drill holes from the Oro Belle Trend ("OBT") at the Castle Mountain gold project (the "Project") located in San Bernardino County, California. Seven holes tested the Oro Belle North Extension ("OBNEX"), immediately north of the former Oro Belle open pit, while four holes tested the area between the Oro Belle, Jumbo and JSLA open pits (the "Gap Zone") in the central part of the OBT. 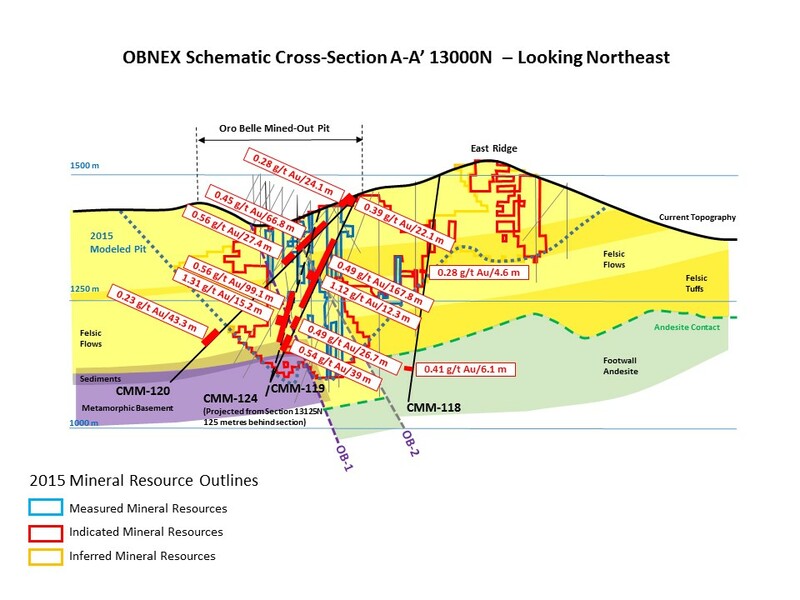 Seven holes tested the extent of gold mineralization over a distance of 200 metres from the northern limit of the Oro Belle open pit, and included three core holes on cross-section 13000N, the fourth in a series of key geological cross-sections over the property. All holes were angled to test mineral resources, and modeled steeply dipping structural corridors and potential depth extensions. 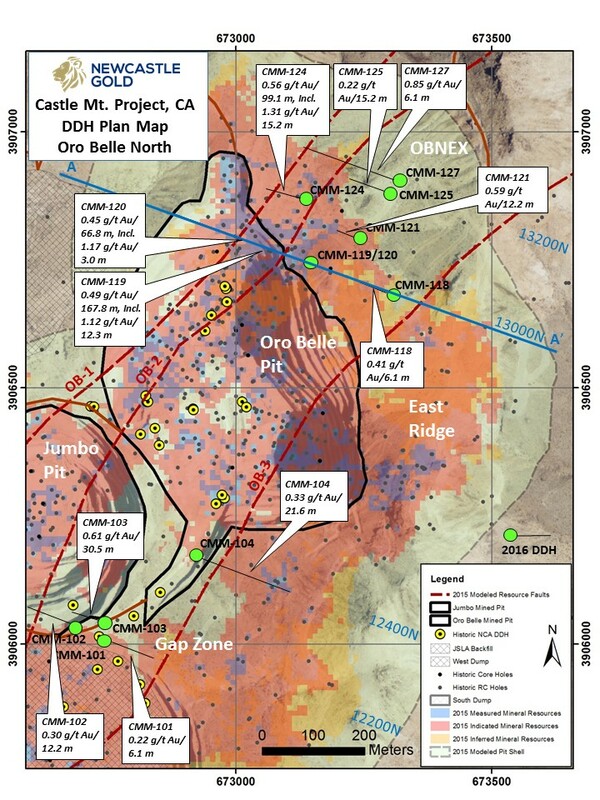 Assay results defined broad zones of gold mineralization within the OB-1/OB-2 structural corridor and extending to the northeast by another 200 metres. The Oro Belle Trend is open to the north and at depth. Gerald Panneton, President and CEO, commented, "Another very good batch of drill results from the summer 2016 Phase 1 drill program demonstrates the importance of the Castle Mountain project as it remains open to the north. Further follow-up exploration drilling along this trend is planned for the second quarter of 2017." All new exploration holes were drilled at either 110 or 290 degrees azimuth, with dips of -45 to -85 degrees, and to a depth range of 350 to 550 metres. True widths of the intercepted intervals cannot be determined from the available geological information. All drill samples are submitted to ALS Minerals in Reno, Nevada for splitting and then crushing until 70% of the sample is finer than a nominal two millimeter in size. A 250 gram ("g") sub-sample is taken from the crushed material and pulverized until 85% passes a 200 mesh (75 µm) screen (ALS Method PREP-31). A 30 g po rtio n of pulverized material (pulp) is then sampled and subjected to fire assay ("FA") with atomic absorption ("AA") finish (ALS Method AuAA- 23). Any gold assays greater than 10 g/t Au are re-analyzed where a 30 g portion is taken from the pulp and assayed by FA with a gravimetric finish (ALS Method Au 30g FA - GRAV). All samples that yield greater than 0.2 ppm assay are also analyzed for gold cyanide solubility (ALS Method AuAA-13). The Company employs an industry-standard QA/QC program consisting of standard pulps, coarse blanks and rig duplicates. The 2016 Phase 1 drill program was completed in mid-October with a total of 20,200 metres in 49 drill holes. Definition and exploration drilling has resumed on the Castle Mountain property with the recently approved 40,000 metre drill program (see press release dated November 1st, 2016) with four RC rigs and two core rigs. Widespread epithermal gold mineralization is present along the Oro Belle Trend where it is hosted within a complex, shallow-dipping sequence of Miocene-age rhyolite flows and tuffaceous units cut by steep northeast trending/southeast dipping fault structures with associated zones of silicification and hydrothermal brecciation, commonly along the margins of quartz porphyry intrusives. 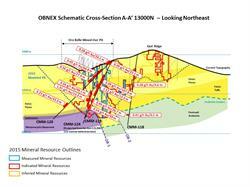 The OBNEX target remains open along strike to the north and northeast, and at depth. 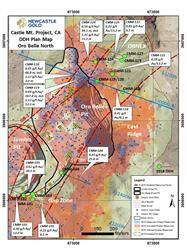 NewCastle Gold has a 100% interest in the Castle Mountain property in San Bernardino County, California. The Castle Mountain heap leach gold mine produced over one million ounces of gold from 1992 to 2004. The Mine and Reclamation Plan, under which the mine operated, was authorized by the County of San Bernardino as the Lead Agency and remains in effect. Water for the drill programs was accessed from existing patented wells on the Project. An updated NI 43-101 resource for the project was announced December 2nd, 2015 which includes Measured Mineral Resources of 17.4 million tonnes grading 0.86 g/t gold containing 0.48 million gold ounces, Indicated Mineral Resources of 202.5 million tonnes grading 0.57 g/t gold containing 3.71 million gold ounces along with Inferred Mineral Resources of 40.8 million tonnes grading 0.58 g/t gold and containing 0.76 million gold ounces. The Project hosts a disseminated low sulphidation epithermal system. Gold is primarily hosted by late-stage rhyolite volcanic units within zones of silicification and brecciation associated with northeast-southwest trending/southeast dipping fault structures which are interpreted to have developed within a collapsed caldera environment. Eleven gold domains are represented by both steep and shallow-dipping orientations. Ian R. Cunningham-Dunlop, P. Eng., the Company's Senior Vice President, Technical Services, is the designated Qualified Person for this news release within the meaning of NI 43-101. He has reviewed and verified that the technical information contained in this release is accurate and has approved of the written disclosure of the same. This news release contains "forward-looking statements" and "forward-looking information" (collectively, "forward-looking information") within the meaning of applicable Canadian securities legislation. Forward-looking information includes information that relates to, among other things, statements with respect to the completion of the proposed drill program at Castle Mountain, the mineral resource expansion at Castle Mountain and the identification of future expansion targets at Castle Mountain. Forward-looking information is not, and cannot be, a guarantee of future results or events. Forward-looking information is based on, among other things, opinions, assumptions, estimates and analyses that, while considered reasonable by us at the date the forward-looking information is provided, inherently are subject to significant risks, uncertainties, contingencies and other factors that may cause actual results and events to be materially different from those expressed or implied by the forward-looking information. The material factors or assumptions that we identified and were applied by us in drawing conclusions or making forecasts or projections set out in the forward looking information include, but are not limited to that the Company is able to procure personnel, equipment and supplies required for its exploration and development activities in sufficient quantities and on a timely basis and that actual result s will be consistent with management's expectations. The risks, uncertainties, contingencies and other factors that may cause actual results to differ materially from those expressed or implied by the forward-looking information may include, but are not limited to, the risks discussed under the heading "Risks" in general to the business of NewCastle in documents filed (or to be filed) with Canadian regulatory authorities. Should one or more risk, uncertainty, contingency or other factor materialize or should any factor or assumption prove incorrect, actual results could vary materially from those expressed or implied in the forward-looking information. Accordingly, the reader should not place undue reliance on forward-looking information. NewCastle does not assume any obligation to update or revise any forward-looking information after the date of this news release or to explain any material difference between subsequent actual events and any forward-looking information, except as required by applicable law. About this company NewCastle Gold Ltd.